After preparing for a long time, the two big events I’d set myself for the year – the Coast-to-Coast and the Etape du Tour – have come and gone in the space of three weeks. The Etape this year left from Pau in the Pyrenees and featured the Col du Tourmalet before finishing at the top of Hautacam. It will be tackled by the Tour on Thursday. 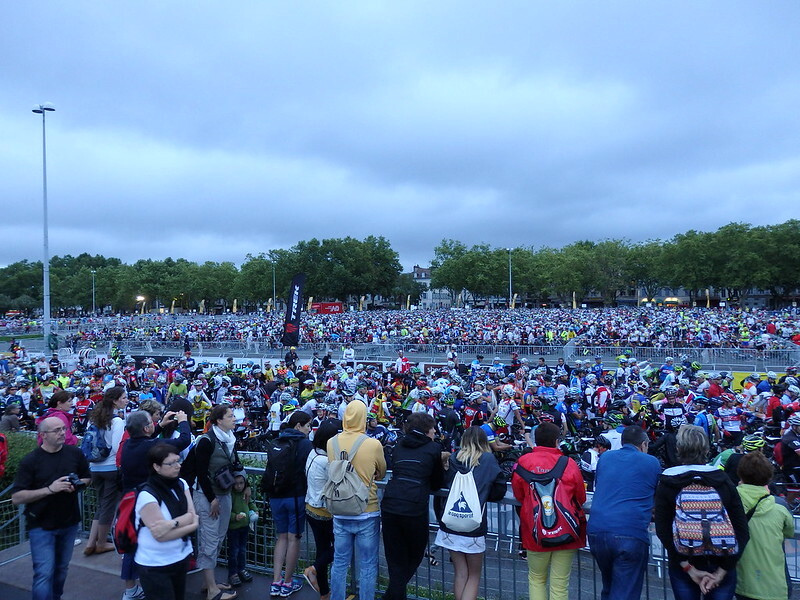 I got to the start of the Etape in the vast Place de Verdun on Sunday morning before the sun had properly risen and it was already filling up. It was eventually full with over 10,000 riders. The choice of clothing had been a problem earlier with stern warnings of the bad weather to be expected on the mountains (they were so worried by storms that they closed down the Etape village in Pau early on Saturday because of the threat of rain and high winds). In the end it was a ride of two weather patterns on the Sunday – warm and humid sunshine in the valleys and cold, cold rain above about 800m. The whole ride had looked in doubt for me as the transfer flight from Paris down to Pau had left without my bike and ‘gutted’ doesn’t even come close to describe the sensation of looking at an empty carousel at the airport. In fact I wasn’t alone and there were about twenty bikes outstanding from a number of flights. Air France handed the whole problem over to a delivery firm and our bikes were driven down overnight by lorry and delivered to our address in Pau the next day. The ride started for me at just before 8:00 and we headed out on the 40 miles of ‘flat’ terrain before the Tourmalet. On the profile this part of the ride looked completely flat and I hadn’t paid it much attention, but there were several hills that would be significant climbs on any of our normal club runs. By the time we started the Tourmalet I looked down to see we had already done 4000 feet of climb! The Tourmalet is immense. Huge! From the town of Bagneres-de-Bigorre the road does not flatten out at all until the top some 17miles away and 1500m higher. A little further on, and on the climb proper, there were signs counting down the kilometers to the summit and giving the average gradient to the next km. These always seemed to be 9% or higher and just reaching the next km sign became an end in itself. It was relentless and awe-inspiring. It started to rain early in the climb and I was soaked through well before reaching the top. I could see about 100m in front of me, rocks to the left of me and an apparent abyss to the right. By the time I got to the top I was cold but like everyone else, nowhere near as cold as I was about to get on the descent. It took nearly an hour to descend with everyone holding on tightly to the brakes in the difficult and slippery conditions. The cold went through all clothing and I was shaking violently and chattering my teeth all the way down and a good way along the valley towards the bottom of the Hautacam climb. And what a fantastic reception we got there! This was where all the families had gathered to welcome the riders onto the climb and off again after the ride was over. Hautacam is a dead-end – the only way down is the way you went up – and so I was climbing on the one side of the road with riders who had finished flying down on the other. They looked cold and soaked so I knew I was in for a repeat of the cold off the Tourmalet and so it turned out. The climb of Hautacam is different to the Tourmalet – where the Tourmalet hardly changes its gradient the whole way up, Hautacam periodically tightens and relaxes its grip. One section would be 5% immediately followed by 14% – there was even a small section of downhill at one point. But there was no getting away from the fact that it was another 1000m to climb in just 8.5 miles and with the climbing already in the legs this was hard going. The 1km to go banner was a welcome sight, as was the final 500m which turned out to be virtually flat. I decided against a sprint finish! Once over the line and with the timer stopped, the only thing to do was turn round and head off back down the mountain, waiting for the warmth of the valley to take away the cold. The whole ride took me just under 7 hours and placed me as 2145th finisher. And as is traditional to sign off these reports: just the one stop for water and no mechanicals. Wow…What can I say! Cracking ride and well done for getting through it in one piece. Hopefully you have warmed up now and are savouring the fact you have completed another Etape! Well done Simon! Very good write up and describes the day perfectly! Well done for just one stop! I ended up doing 5 of which one of them was for over 40 mins to warm up before the descent of tourmalet. I have never seen so many thermal blankets in one place!!!! But as you say the atmosphere on the tourmalet was brilliant….